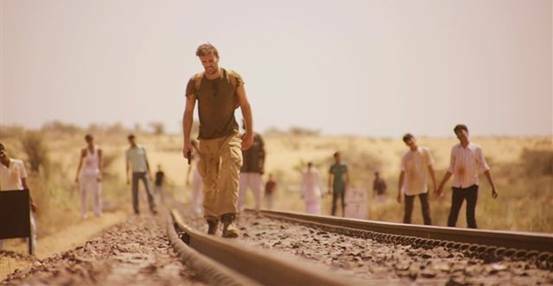 This year’s festival opens with the world premiere of The Ford Brothers THE DEAD 2: INDIA - the first-ever International production of a zombie film shot in India . Howard and Jon Ford, the British director, writer and producer team behind the acclaimed African-set zombie road movie 'The Dead’ said today: “It's truly an honour to be the opening film – mind-blowing! Being at FrightFest for ‘The Dead’ was such an incredible experience for us and one of the highlights of our whole journey with the film. It's an awesome event with a brilliant crowd and we both sincerely cannot wait to see you all there!”. The film follows the story of India-based American engineer Nicholas Burton (JOSEPH MILLSON) in a race against time to reach his pregnant girlfriend Ishani Sharma (MEENU). Burton enlists the help of an orphan street kid Javed (ANAND GOYAL) and together they make a perilous 300 mile journey across deadly landscapes as a zombie apocalypse threatens to engulf the entire nation. Film4 FrightFest will close with the UK premiere of directors Aharon Keshales & Navot Papushado’s extraordinary revenge thriller BIG BAD WOLVES. Soaked in twisted tension, fairytale myth and seat-edged suspense, the film follows the lives of three men on a collision course: following a series of brutal murders: the father of the latest victim now out for revenge, a vigilante police detective operating outside the law, and the main suspect in the killings - a religious studies teacher arrested and released due to a police blunder. Aharon and Navot said today: “We always dreamt of having a film which would be good enough to be shown at FrightFest, but not even in our wildest dreams did we think that an Hebrew speaking revenge thriller would get us there. FrightFest is really making history here. As a token of our appreciation we promise to give everyone there a night they won't easily forget”. All the directors and some cast members will be attending the festival. Film4 FrightFest Co-director Alan Jones commented: “Film4 FrightFest is delighted with our Opening and Closing Film choices. Both THE DEAD 2: INDIA and BIG BAD WOLVES represent everything FrightFest is about; the discovery, nurturing and celebration of vital new voices in the genre. FrightFest launched the Ford Brothers' THE DEAD to worldwide acclaim in 2010 and Aharon Keshales and Navot Papushado's RABIES in 2011 became the only movie in our entire 14-year history to warrant successive extra screenings based on overwhelming want-to-see demand. So to welcome both duos back with their stunning new movies, both exploring unusual cultural aspects within a remarkable genre framework is an absolute thrill. These films bookend Film4 FrightFest perfectly and hint at what we are trying to achieve this year - the best platform to deliver our broadest, most diverse and most surprising event ever”. Film4 FrightFest, the UK ’s biggest genre film festival, runs from Thursday 22 August to Monday 26 August at the Empire Cinema, Leicester Square . The full line up will be announced on Fri 28 June. Festival & day passes go on sale from 29 June. Tickets for Individual films are on sale from 27 July.